Endometriosis is a common health problem in women. It gets its name from the word endometrium, the tissue that lines the uterus or womb. Endometriosis occurs when this tissue grows outside of the uterus on other organs or structures in the body. Endometriosis is an under diagnosed and undertreated problem. This delay in diagnosis can contribute to impaired quality of life and may have implications for fertility. Outer surface of the uterus. There is no complete agreement on what the process of endometriosis formation is. The causes appear to be multiple. Symptoms of endometriosis can vary. Some symptoms can be vague and aspecific. What are possible clinical signs of endometriosis? What Clinical tests can suggest presence endometriosis? 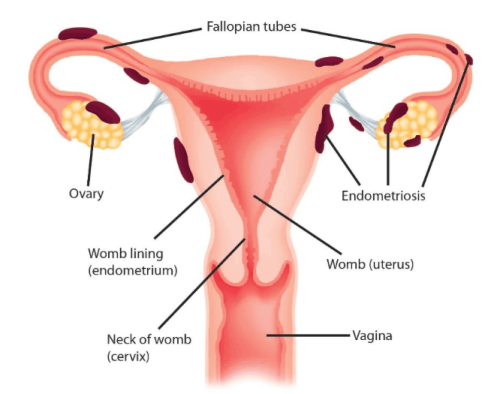 If ovarian cysts are present, they may have features of endometriomas (blood-filled endometriosis cysts). In this case a diagnosis maybe very easy. In many other cases, medical tests can be indicative of a high probability of endometriosis. 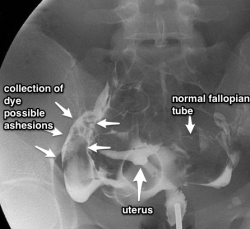 Blocked tubes or signs of adhesions at HSG ( Hysterosalpingogram). Ultrasound reveals that the ovaries are not normally mobile but are instead “stuck” to the top of the uterus or to the side of the pelvis. 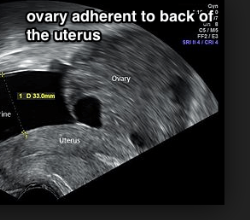 Usually this makes the ovary more difficult to see and the doctor may have to push on you abdomen in order to see it. Vessel blood flow abnormalities. 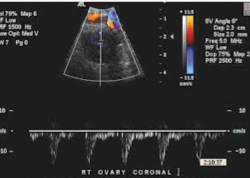 Doppler studies of the blood flow to the ovaries may reveal reduced flow or even inverted flow of blood. 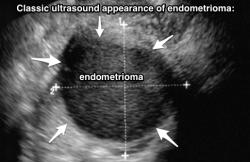 Presence of suspicious areas of "adenomyosis" (areas of endometriosis in the muscle part of the uterus).